This is not really a video for viewing, but rather for listening. OH YEAH... and to make up for the spider post yesterday. THIS IS WHAT WE WAKE UP TO EVERY MORNING! I captured this video early this morning right after I fed the birds. I decided to sit out on the lanai having coffee, checking e-mail and waking up this morning since it was so nice. It's been too cold to do that the past few months and now that spring is finally here we can enjoy a quiet moment in the morning before the work begins. These are the sounds of the Northern Cardinal, Brazilian Red-Crested Cardinal, Japanese White-Eye, Gray Francolin, Ring-Neck Pheasant (in the distant background at 29secs in), Spotted Doves, Zebra Doves, Java Sparrows, Myna Birds, Assorted Finches and the loudest of them all... the Melodious Laughing Thrush. Throw in the occasional rooster, green parrot, cow, horse and donkey and this is what makes living in the country so great. To us it's not noise. It's music. It's quiet and calming. We very much cherish these peaceful and quiet moments. Here is a detail of the Melodious Laughing Thrush. They hang out on the Ti in front of the shed window and sing to them selves from time to time. Dig her make-up. I don't have any really great close-up shots because the birds are gone before I can get close enough. I need a great zoom or telephoto lens, so if anyone has a suggestion for a lens that will fit my Canon Rebel XTi that would be great. That was simply lovely. 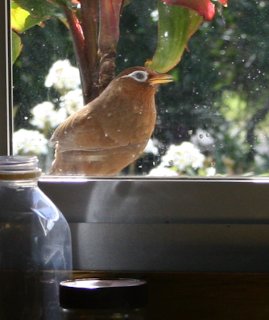 I've never seen that Laughing Thrush - that eyeshadow is fabulous! I got a Canon 70-300 IS for Christmas of 07, I've really enjoyed it. It's so darn heavy, but that's my only complaint. You can check it out when we're there. I'm PRETTY sure it will fit all the Canon SLRs?? and yeah.. that thrush is something. they hop like cartoon characters. almost like a robin. and they follow us around when we are in the gulch trimming. quite inquisitive. the brazilian cardinals showed up today with their baby. so cute. I love the birds, we just got home from the Big Island this morning and I miss them already. But my husband did ask why the birds aren't eating the spiders. Yikes those are big. carlae... I hope you had a great time here in Hawai'i. The birds do eat the spiders...but the spiders are in most cases bigger than the birds. HA. I have footage of Kekoa gobbling one down. It was random. I was filming him when the cane spider hopped by and he took advantage. I don't have it in me to post the carnage. We really hate killing anything here and will usually catch anything that is in the house in what we call the bug ambulance and release outside far from the house. WITH EXCEPTION TO CENTIPEDES. The bug ambulance is a sour cream tub and cardboard slide under it. No sirens? No blaring of the horns? No sounds of street traffic? What a wonderful way to start your day...Heavenly!! Has maui been spared from the chicken infestation that seems to plague Kauai? There i'm usually awakened by roosters at 5am. James, We do have a few feral roosters and chickens on Maui, but for the most part no. The reason Kaua'i has so many is that when hurricane Iniki hit in "92 all the roosters and chickens escaped. Or that is the story we got when we visited. I dug her make-up and thought, "KABUKI". She's an actress. She is most definitely an actress.